Wow! Thanks for showing your stripes for tigers—your online votes from earlier this week helped our on-the-ground conservation partner, MYCAT, win funding to expand anti-poaching patrols in Malaysia. It's amazing what we can do when we join forces as a community with partners in the field to fight for a better future for wildlife! 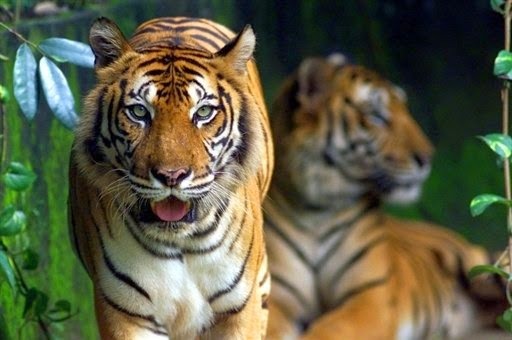 Woodland Park Zoo and Panthera work together with on-the-ground partners in Malaysia to protect tigers and their forests—and now one of those partners needs your help! MYCAT (Malaysian Conservation Alliance for Tigers) needs your vote to receive $30,000+ to expand its CAT Walks program, where trained volunteers trek through Malaysia’s rain forests looking for signs of poachers. Snares and traps are recorded, deactivated and reported to the authorities. A poacher's snare hidden in a tree. Photo: Fred Koontz/WPZ. CAT Walkers celebrate finding and confiscating a cache of snares hidden in a tree trunk. Photos: Fred Koontz/WPZ. This is critical work: the more eyes in the forest and boots on the ground, the more opportunity we have to deter poaching. To support tiger conservation, follow this link to the European Outdoor Conservation Association and vote for the project titled “Citizen Action for Tigers (CAT), Malaysia.” Voting is just a click away and it's easy to do: no log ins or sign ups required! Share this with your friends and have an even greater impact. CAT Walkers also check remote camera traps to monitor for signs of wildlife. Data from camera traps allow park rangers to predict routes for anti-poaching patrols. Photo: Kae Kawanishi, MYCAT. Tigers will return to Woodland Park Zoo with the opening of Banyan Wilds, May 2, 2015. Guests will discover more stories of the hard work being done in the field to save tigers, and ways we can help even from all the way across the globe. Every visit to Woodland Park Zoo makes this work possible—and with your online vote, we can help get even more great work done! Thank you.